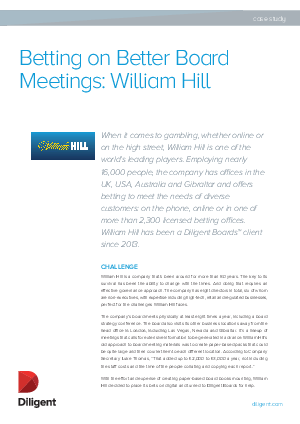 William Hill made a faster-than-expected transition to using Diligent Boards due to rapid adoption by the board members and proactive support from both William Hill’s Secretariat team and Diligent. In addition, the company found one unexpected benefit –Diligent Boards is a very helpful tool when new directors join the board. Use of Diligent Boards has spread thanks to positive word of mouth from William Hill board members to other companies on whose boards William Hill board members also serve.